THE Museum of Perth has moved into new digs at the historic Atlas Building on the Esplanade. 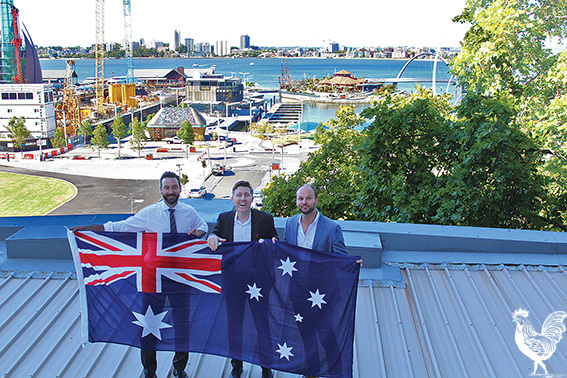 Plans to restore the building and build up a presence include reviving a tradition of flying the Australian flag, one that’s been dormant for half a century. The Atlas Building was opened in 1931 to house the Atlas Assurance Company, and Museum chair Reece Harley says they’ve pored over old photographs and the last flag they could spot fluttered for Queen Elizabeth’s antipodean visit in 1954. In the lead-up to Australia Day federal MP Tim Hammond dropped by to donate an Australian flag. Mr Harley says there are also plans to restore the iconic Atlas statue that stood on the roof until 1969. “We’ve found it … it’s at a secret location, and we’re working with the owner of the building to put it back there,” he says. The museum’s first exhibition in the new spot is a history of the building itself, and it’s riddled with interesting tales. The foundations were laid before the Great Depression hit full swing, and construction continued despite tough economic times: “It was opened right in the midst of the depression, and it’s a statement of confidence in WA that they continued building it,” he says. It’s also significant for having all of its architectural detailing done by Margaret Pitt Morrison, the first registered female architect in WA. Daughter of famed architect George Pitt Morrison, she’d go on to design many more of Perth’s buildings. Over the years it’s hosted the AB Webb School of Art, the Road Board of Perth, the Stock Exchange of Perth and the Wheat Board. In 1933 Professor Frank Beasley gave a lecture there on Fascism to the Perth Junior Chamber of Commerce.